Wake up early and realise I am in Israel: Wednesday, home; Thursday, Devon; Friday, Luton; Saturday, Tel-Aviv. Tomorrow I’ll wake up in Eilat, one of the migration hotspots of the world where birds pour through from African wintering grounds to Europe and Asia. Can’t wait! Today we start fairly early, and slightly jet-lagged, at 6am and rendezvous with various others before setting off for the drive south to Eilat. Our route will take us through farmland a bit like central Spain (cereal fields in rolling hills with groves of olives and almonds), then through the desert and then to the tourist destination of Eilat on the Red Sea. Even standing outside the hotel as the light builds, it is obvious that the birds will be a mixture of the utterly familiar, such as House Sparrow, Blackcap and Collared Dove, the fairly familiar (eg Glossy Ibis) and the unfamiliar (eg Laughing Dove) – and there are all those desert species to come too. 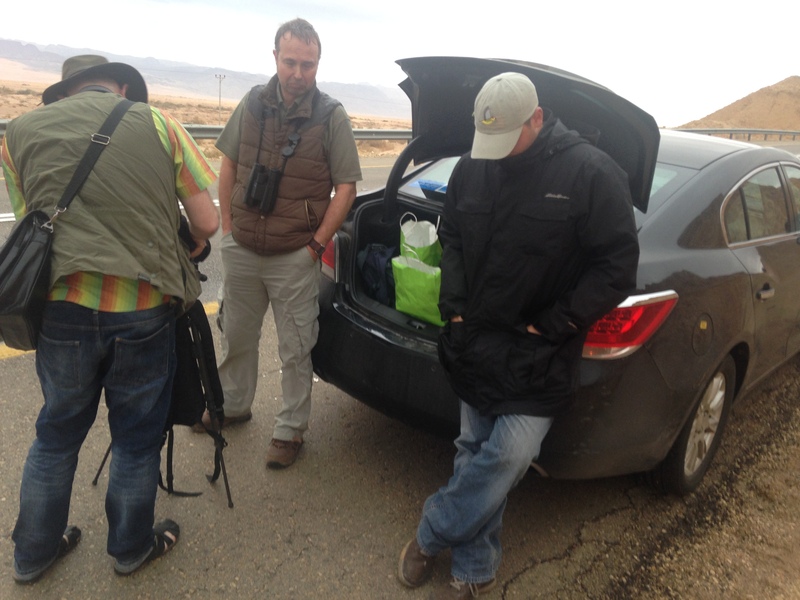 Two cars of eight birders (the three of us and Tom Reed in one car and the Way-off Coursers Team in another) travel together and looked for Long-billed Pipit (which we saw) at one site and for Bateleur (which we didn’t see) at another. But at the pipit sight the top bird, obviously(! ), was a male Hen Harrier that soared overhead in great light. Our American friends, for it doesn’t take long to become friends when birding, were blown away by how attractive, or ‘spanky’, this version of their rather less ‘spanky’ Northern Harrier was. We saw more ‘spanky’ Hen Harriers through the trip and ‘spanky’ is now in the vocabulary. At the Bateleur site (without a Bateleur) the best sighting was of a large flock of White Pelicans heading north – a beautiful sight, and one which whetted the appetite for more migration over the next few days (although these were the only pelicans we saw). The two cars then went their separate ways – neither journey went to plan! The other team were planning to see some plains birds but as we both travelled south the rain started, in the desert, and birding was just difficult, and there were warnings of flash floods too. We travelled south and stopped at a McDonalds at Avdat because there were reports of Desert Finches – and there they were, dumpy bullfinch-looking birds, but pale and plain as befits a desert bird. Also here, round the back of a crowded McDonalds remember, was a Long-legged Buzzard, and in the small grove of trees were a female Semi-collared Flycatcher, an eastern Redstart, some Lesser Whitethroats, Tristram’s Grackle and Arabian Babbler. This was fun – and it was definitely that mixture of the familiar and new for me. We liked this place a lot – we put it on our list of places to return to in the race itself, only three days away. We were one of 16 international teams competing to see the most species in 24 hours, starting and ending in Eilat. There were teams from the UK, Finland, USA, Greece, the Netherlands, Switzerland, South Africa and Spain. Just imagine the range of experience and inexperience spread across them all. Like for me, for many, this was their first visit to Israel. The car was a bit quirky – an automatic but also requiring a pin code before the engine could be started. It seemed a bit temperamental and we were beginning to develop various superstitions about where your feet had to be, whether the key had to be removed and reinserted before the engine would fire etc etc. 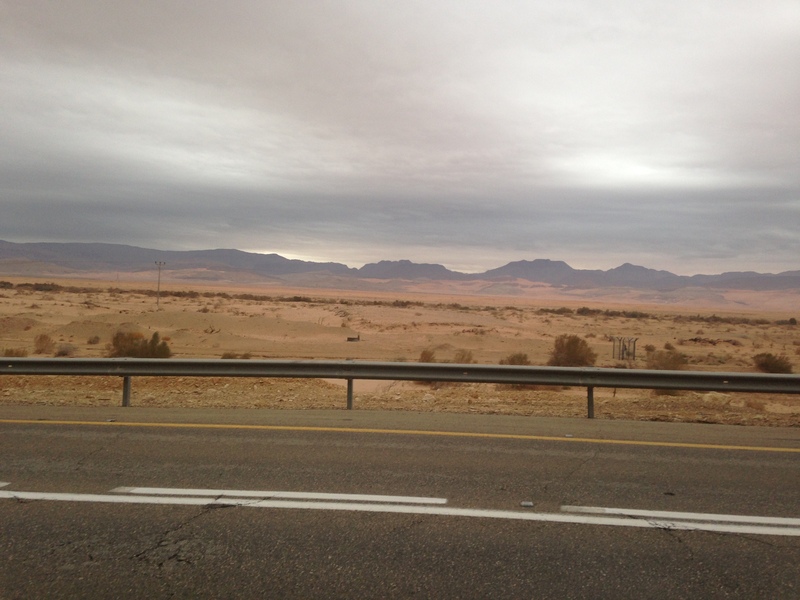 But as we entered the Negev Desert proper the car started playing up. It would run badly for a while and then for a while all would be smooth again. Mike was driving and did a fantastic job nursing the car along. It was raining and we were miles from anywhere, we needed to get to Eilat for a briefing (and food – it was a long time since breakfast). We drove for about an hour, maybe less, with the car sometimes crawling along and somethings whizzing along, and then it conked out. Rather miraculously, we broke down in a relatively safe place, with a fantastic view of the mountains of Jordan on our left, with some good birds in view and it wasn’t raining. Could have been much worse. A taxi came out to meet us from Eilat and after just an hour or so by the side of the road we were hurtling towards Eilat. And I mean hurtling – the speed limit varied between 90kph and 110kph on the route and our driver varied between 120 and 135kph. I was sitting in the front and my side of the windscreen was misted up, and I hoped his wasn’t, but the taxi driver was on the phone, driving through the dark, in torrential rain. It was one of those team-building experiences! …although the view was rather good. At Eilat we started meeting loads more birders, had something, rather wonderful, to eat from the hotel buffet and then had a briefing from the organisers of the event, including the quite wonderful Jonathan Meyrav and Dan Alon. And so to bed after a full day’s birding, a breakdown, new friends, new birds, a ‘spanky’ male Hen Harrier, views of Jordan, a ride through the desert in the rain, a McDonald’s with birds behind it and those pelicans. Quite a day. Up for dawn tomorrow, for the first of two reconnaissance days ahead of the race day on Tuesday. ‘Time spent in reconnaissance is seldom wasted‘ – a quote which appears to be variously attributed to almost every military leader in history! I like the ‘seldom’ – that, for me, makes it such a good quote. The event is over – but the cause goes on! Please consider topping up our fundraising pot here. Thank you for all contributions. Just imagine that desert in a few days time. Full of flowers and Painted Ladies moving north!! Been fortunate to see that!